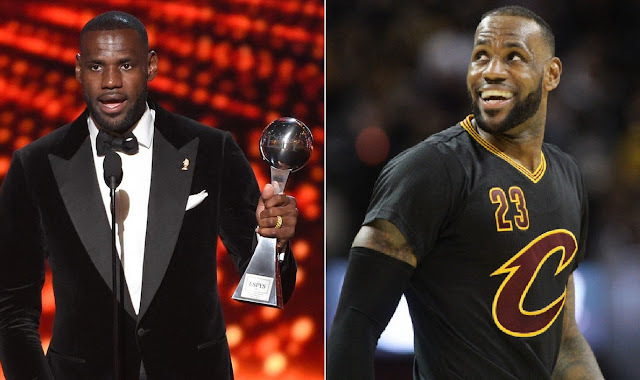 NBA - Cleveland Cavaliers superstar LeBron James did not win in this year 2017 NBA Championship against the Golden State Warriors nor the NBA Regular Season Most Valuable Player (MVP) but at least he was recognized by the ESPY Award as they named LeBron James as the 2017 ESPYS NBA Best Player. ESPY Award is the short term for Excellence in Sports Performance Yearly Award it is a yearly award giving bodies that started in 1993, recognizing the individual talent and team athletic achievement in any sports each year. In the National Basketball Association (NBA) the very first award given for ESPYS NBA Best Player Award was given to the Greatest of All-time (GOAT) Michael Jordan. Jordan won the award 4 times as a member of the Chicago Bulls he won it in 1991 and 3 consecutive years in 1997, 1998 and 1999 where the Bulls made their second three peat NBA Championship. Aside from Michael Jordan, there are also several players that win the award multiple times, Hakeem Olajuwon had 2 awards, Tim Duncan with 2 awards and Kobe Bryant also with 2 awards while LeBron James has the most award wins with 6 ESPYS NBA Best Player the most in NBA History. LeBron James currently holds the most ESPYS NBA Best Player Awards with 6, he had in 2007, 2009, 2012, 2013, 2016 and 2017. in 2009 he won the award despite not making in the NBA Finals while in 2012, 2013 and 2016 where he won the award he had 3 Championships 2 rings as a member of the Miami Heat and 1 as a member of the Cleveland Cavaliers. While in 2007 James wins his first award in 2007 as he becomes the first player in NBA History to win the prestigious awards despite losing in the NBA Finals over the San Antonio Spurs and in 2017 James repeated it again by winning the 2017 ESPYS NBA Best Player Award in another NBA Finals loss to the Warriors. Aside from James, Kobe Bryant also wins the award in 2008 in a losing effort in 2008 NBA Finals over the Boston Celtics. Both LeBron James and Kobe Bryant are the only two NBA Players that won the award despite an NBA Finals loss that year. No Comment to " LeBron James Holds the Record for the Most ESPYS Best Player Award "